SecretofMana.fr.fm offers you Sword of Mana before Santa Claus! Ho ho ho! No, it is not Santa Claus but Randi who offers you in exclusivity the Sword of Mana US version Rom. All of you who could not play the Japanese version finally will be able to play this great episode of the Seiken Densetsu series. For those of you who can speak French, you can get a free 7.62€ voucher usable on the whole new SecretofMana.fr.fm video games shop. In order to propose a forum as stable as possible, the SecretofMana.fr.fm Forum was updated from IPB 1.2 to 1.3. It is the occasion for the undecided ones to join us. That's all folks! Have a wonderful week! A new contest arrives on SecretofMana.fr.fm! Before the ending of the Fan Art Contest, SecretofMana.fr.fm propose you a new contest which is unique in the world! The aim is very easy. You like SPC? So make a Windows compatible SPC synth which will have the same features as the SNES. Your software will have to be easy to use and allow the users to edit SPC, import SPC music banks and save them as new SPC. You can write your program in any language (Java, Visual Basic, ...). 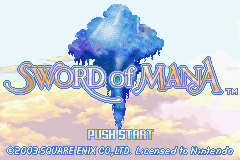 A lot of people are currently waiting for Sword of Mana to be released in America in order to play it. Nintendo America announced that Sword of Mana will be sell from 1st December 2003!!! The game was initially supposed to be available from this month but it seems that Nintendo wanted people to wait the Xmas season before selling the new Square-Enix jewel! You'll have to add Sword of Mana to your gift list! To conclude this newsletter, here's a small list of small updates on SecretofMana.fr.fm. First the Lycos ad frames problem. Most of you noticed them and they're a real problem for the navigation on the 4 mirror sites. The problem has been solved for the index page and will be soon solved for the rest of the site wich will be translated from HTML to PHP language. To conclude, the SecretofMana.fr.fm banners have been updated in order to show you the features of the site! You dreamed it, SecretofMana.fr.fm did it! SecretofMana.fr.fm proudly presents one day before the official release and in exclusivity, the Shinyaku Seiken Densetsu - Sword of Mana Rom. A HIT you have to own! No need for you to speak Japanese to understand the game! SecretofMana.fr.fm has now a new Forum! In these very hot days, I propose you to discover a new refreshing Forum on SecretofMana.fr.fm!! English users still can register so don't wait anymore and join us. Don't remember that if you post messages, people who are registered and who speak French can also speak English with you so post and other users will fallow you! But I'm sure you'll ask me what's new with this new Forum? Like phpBB, each member has a private inbox and can set the options he wants. The new features are Avatar upload (5Kb maxi) or avatar gallery. But that's not all! A calendar is also installed so you can easily check important events. Then, this forum solves a lot of small problems that users don't always see. 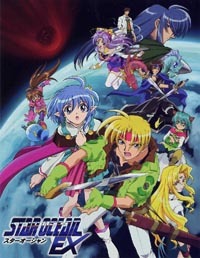 Get ready to welcome the newest Seiken Denstsu episode: Shinyaku Seiken Denstesu - Sword of Mana which will be available from 29th August 2003 in Japan. For US residents, they'll have to wait a few days more because the game will be on sale from September 2003. And for Europeans, the game is on sale on the web and many website propose you to pre-order it. On 1st January 2004, it will be too late! The FAN ART contest gathered a lot of artists who made a great job. You can still send you FAN ART but don't wait because it finishes on 31th December 2003. 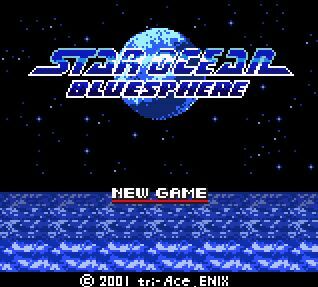 Star Ocean Bluesphere finally on SecretofMana.fr.fm! Star Ocean fans, here's a game for you! After the Star Ocean Forum, discover a great game for your Game Boy Color! 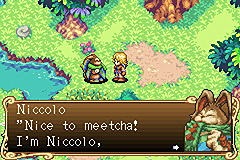 Join the Star Ocean The Second Story heroes in this GBC game. Unfortunately, Tri-Ace choose the GBC and not the GBA. The game could have better graphics and music on GBA. But even with GBC, Enix made a great game and used all the GBC abilities! Next update on June 28th! Due to the exams, the next SecretofMana.fr.fm update won't be in 2 weeks but in 4 weeks! That's also a reason why updates are so poor. To all of you who have exams, good luck! Good news from the E3 for Seiken Densetsu fans ! E3 (Electronic Entertainment Exposition) took place from May 13th to 16th 2003 in Los Angeles. All RPG fans waited this event for a long time. Nintendo showed new images of Sword of Mana (Shinyaku Seiken Densetsu). In addition, Nintendo France didn't wait to show these news images and a video (available on the Nintendo website) of this new game. This is a good news because it means that we'll have Sword of Mana here! SNESAMP 3.01a, the SNES music revolution! Here's the new AlphaII plugin for Winamp 2.x, SNESAMP 3.01a. This new version is a little revolution for the SNES SPC music because it plays SPC files with a better quality than the real SNES! There are 3 modes: High quality, SNES quality and Custom quality. An excellent software you need! Hear, hear Star Ocean lovers, The Star Ocean Forum is now opened. There was something which was missing for this wonderful series: a discussion place. Now this place is opened and awaits you, Star Ocean fans! Customize your folder under Windows 9x with Seiken Densetsu! 1st fan art contest check-up 7 months before the end: CONGRATULATIONS to the fans! The fan art contest started at the end of the last year and it gathered a score of fan arts. CONGRATULATIONS to the fans who participated! It's not yet too late to send your fan art. The contest will finish on December 31th of 2003. You'll still be able to send your fan art after this date. The forum is there to reply to all your questions. If you have a problem you can ask your question there. 4 weeks without update justificated! 4 semaines without updates, it's long, isn't it? So here's 4 weeks of work! Take a deep inspiration. Here we go! The Secret of Mana characters page is finally ready! Discover or re-discover the actors of Secret of Mana. An exclusive and explosive file on Shinyaku Seiken Desnetsu!! Square & Brownie Brown finally shown their new creation: Shinyaku Seiken Densetsu! The problem, that was in Japanese! So I decided to work on a translation of these news (that's why it was so long for me to update!!) 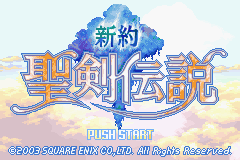 to offer you a translation of the Shinyaku Seiken Densetsu files! You'll learn a lot of thing. For example, we'll see in this new episode FLAMMY and other old friends. But shh, I'll let you discover this hot files! ... to offer you a complete page on Secret of Mana weapons with illustrations for each weapon, the attack points, special effects and the location of the orb. A real work of Titan! Who are Secret of Mana characters - 1st part! SecretofMana.fr.fm proposes you to discover who are the Secret of Mana characters. For this 1st part, discover our 3 heroes. The fallowing characters will come soon! If you can read this message, it means you don't have any problem with the newsletter. But for some users, reading HTML mails is impossible. Thta's why an error message will display for them, inviting them to go to the Newsletter page to read it. Due to technical maintenance, SecretofMana.fr.fm mirror servers won't be updated this week. They'll be updated on March, 30th. Next week you'll discover the 2nd part of the Secret of Mana characters page. Registration is free and you can set English as Default Language! That's all folks! Enjoy your week! FAN ART CONTEST, some pics received! As you may know, SecretofMana.fr.fm organizes an International FAN ART contest. The theme is easy: Secret of Mana & Seiken Densetsu. Your art will be displayed on the future FAN ART page so don't wait a minute and make your fan art today! Next week 2 new pages will open: Secret of Mana weapons and Secret of Mana Characters. A test: which character of Secret of Mana are you? A newsletter easier to read! From today the newsletter becomes easier to read in order to give your more comfort. - Quickjump links are on top of each newsletter. - A menu on the right contains news and updated links. - A title for each news wrote in green. SecretofMana.fr.fm is a website based on Secret of Mana! That's evident! But we sometimes wonder if it's really true because a lot of pages on Secret of Mana are missing. That's why 2 new pages have been added: Secret of Mana items and Secret of Mana magics. Next updates will also be Secret of Mana pages in order to open all the Secret of Mana pages! After receiving always the same questions, I finally wondered if it was not a better think to reply the questions before they're asked! It's now done and a FAQ replies to the Frequent Asked Qestions! New design for the Forum! In order to propose you something new, SecretofMana.fr.fm Forum is now full of stars which make him nicer than before! In addition, in order to give you larger way to give your opinion, new smileys have been added to the Forum. As I received a lot of mail, I decided to stop the controversy about the Final Fantasy and the Seiken Densetsu series. As a matter of fact, I wrote that Mystic Quest Legend on SNES was the 1st Seiken Densetsu whereas it doesn't belong to these series. The real Seiken Densetsu 1 is Final Fantasy Adventure on Game Boy that's to say Mystic Quest (EUR). Final Fantasy I, II & III on NES. Final Fantasy IV, V & VI on SNES. Seiken Densetsu 3: tout sur tout! Legend of Mana: même chose que précédemment. Seiken Densetsu : The new Testament: News et ensuite un dossier complet. Star Ocean 1 à 3: un gros morceau mais qui mérite d'être exploité. Au menu, tout ce qui peut être expliqué sur le jeu plus de musiques et des images. Tous les liens sont actifs et ce pour des raisons de commodité mais les nouvelles pages sont vides! 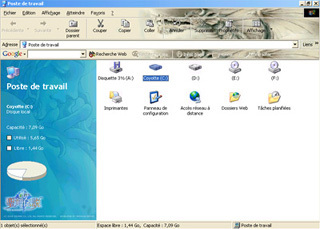 En effet à chaque mise à jour il faut uploader les pages sur 5 serveurs différents et refaire les menus français et anglais. C'est donc une solution qui me permettra d'aller plus vite! Sur la page d'accueil sont inscrits le nom des pages ouvertes ce qui facilitera votre navigation. Voilà, c'est tout pour aujourd'hui! Bon surf à tous! Legend of Mana: the same as before. Seiken Densetsu: The new Testament: News then a complete file. Star Ocean 1 to 3: A big part of the project but which deserve an important place. Music, images & more! All links are active but most of pages are empty! That's a way to simplify the updates because on each update I have to change the French and English menu on each page and then update these pages to 5 servers! On the homepage you can check which pages are opened. That'll help you. That's all folks. Have a nice surf! SecretofMana.fr.fm - The Secret of Mana tribute - La tribu de Secret of Mana! RPG, ROMS, emu & more! Français: Bonjour à tous! Au programme: le nouveau CHAT! English: Hello everyone! This week, discover the new CHAT! - une nouvelle ROM: Terranigma. Terranigma arrive cette semaine sur SecretofMana.fr.fm. Un jeu édité par ENIX qui se situe dans la lignée de Illusion of Time. Un assez bon mélange à découvrir dans la rubrique des ROMS SNES. http://www.SecretofMana.fr.fm/roms1fr.htm. Et oui il y a un an, SecretofMana.fr.fm ouvrait ses portes. A l'occasion de son 1er anniversaire, je vous propose de découvrir ou de re-découvrir les débuts de cette formidable aventure: http://www.SecretofMana.fr.fm/retro! Le Forum est ouvert aux discussions et n'hésitez pas à venir mettre votre grain de sel! C'est tout pour aujoud'hui! Bon surf à tous! Terranigma arrives this week on SecretofMana.fr.fm. A game edited by ENIX in an Illusion of Time style. A quite good mix that you have to discover. To celebrate SecretofMana.fr.fm first anniversary, I propose you to discover or rememebr how all this adventure started: http://www.SecretofMana.fr.fm/retro! The Forum is still waiting for you, particularly you, English users! I remember you that if you register you can turn the language to English. That's all folks! Have a nice surf!